As announced on February 15, 2011, pursuant to an option agreement Tigers Realm has the right to earn up to a 70% interest in the Jelai Gold project by meeting certain project expenditure obligations and completing a bankable feasibility study by June 2, 2015, the expiry of the IUP. Tigers Realm's proposed drill program expenditure is US$2m over the first 18 months with approximately 8,000m of drilling at the Mewet Prospect planned. 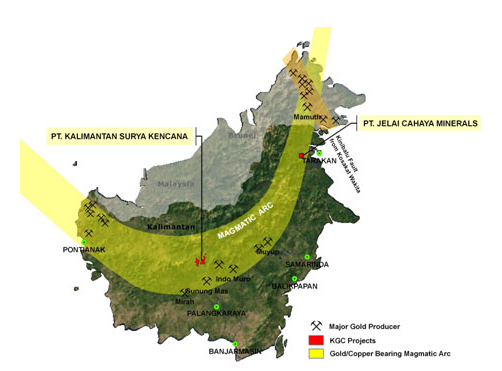 The Mewet prospect is the Company's flagship gold project. It has a total of 126 shallow diamond drill holes totaling approximately 14,000 meters. Grid soils, surface mapping and drilling confirmed more than 6km combined strike length of low sulphidation, vein-style, epithermal, gold-silver mineralization, comprising the Mewet, Sembawang, Lipan and Nyabi veins. 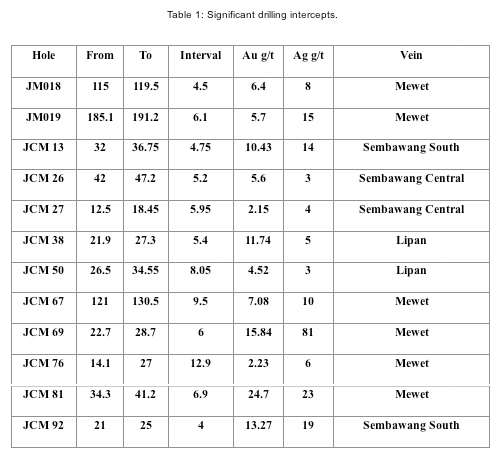 Previously, shallow drill holes targeted the central areas of the Mewet, Sembawang and Lipan Veins, with high grade mineralized shoots intersected at each, shown in Table 1. Interpretation of mineral textures in veins and comparison with models for low-sulphidation epithermal systems indicates the current level of exposure is near the top of the precious metal zone. Limited fan style drilling confirms the Mewet vein becomes thicker at depth and that mineralization extends over at least 200 meters vertically. As part of Tigers Realm due diligence, the investigative geologic team collected representative skeleton drill core samples (10cm in length) from mineralized intervals of selected holes. 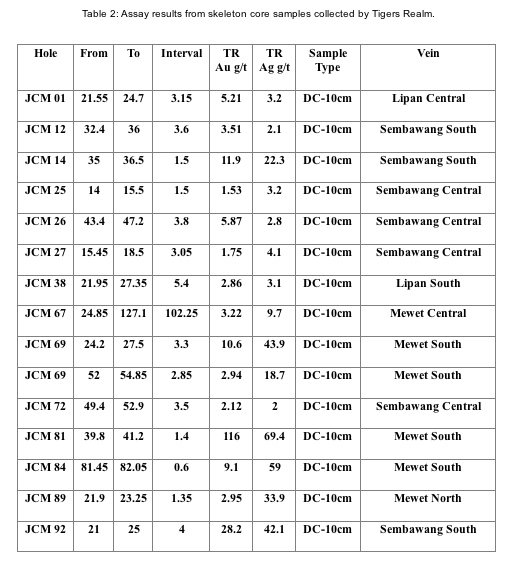 Assay results confirmed high grade gold and silver mineralization, and assay results are shown in Table 2. 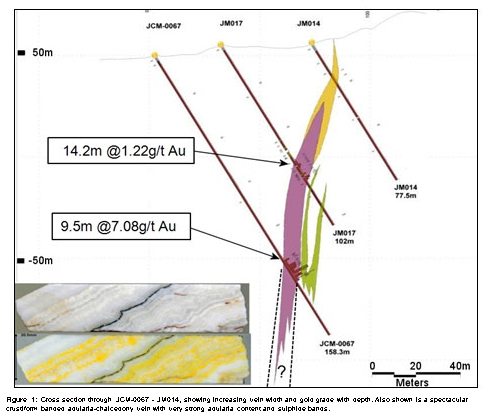 Six of the samples collected from drill core at the Mewet property were prepared and stained in Australia, to test for adularia. Results indicate that adularia is a common component of crustiform banded veins at Mewet and is associated with high grade gold mineralization (Figure 1). The combination of vein textures and mineral-textural zonation and apparent overlapping of zones is promising that stacking and overprinting of various zones has occurred, and such a process can increase the total metal endowment of the vein, particularly in shoots. The metal ratios with approximately equal Au: Ag also support the concept observed in other epithermal systems that the mineralization encountered in Mewet occurs in the upper to middle part of the precious metals zone (observations also made by previous geologists, e.g. Worsley, 1999). Based on these data, Tigers Realm geologists interpret high grade shoots may have developed for at least 200 meters below the current depth of drilling, within parts of the Mewet vein system. The Qualified Person responsible for the technical content and verification in this press release is Dr. Peter Pollard, the Company's Qualified Person. This news release contains forward-looking statements that are based on the Company's current expectations and estimates. Forward-looking statements are frequently characterized by words such as "plan", "expect", "project", "intend", "believe", "anticipate", "estimate", "suggest", "indicate" and other similar words or statements that certain events or conditions "may" or "will" occur. Such forward-looking statements involve known and unknown risks, uncertainties and other factors that could cause actual events or results to differ materially from estimated or anticipated events or results implied or expressed in such forward-looking statements. Such factors include, among others: the actual results of current exploration activities; conclusions of economic evaluations; changes in project parameters as plans continue to be refined; possible variations in ore grade or recovery rates; accidents, labour disputes and other risks of the mining industry; delays in obtaining governmental approvals or financing; and fluctuations in metal prices. There may be other factors that cause actions, events or results not to be as anticipated, estimated or intended. Any forward-looking statement speaks only as of the date on which it is made and, except as may be required by applicable securities laws, the Company disclaims any intent or obligation to update any forward-looking statement, whether as a result of new information, future events or results or otherwise. Forward-looking statements are not guarantees of future performance and accordingly undue reliance should not be put on such statements due to the inherent uncertainty therein.